CAF T-33 133275 in Snowbird scheme. 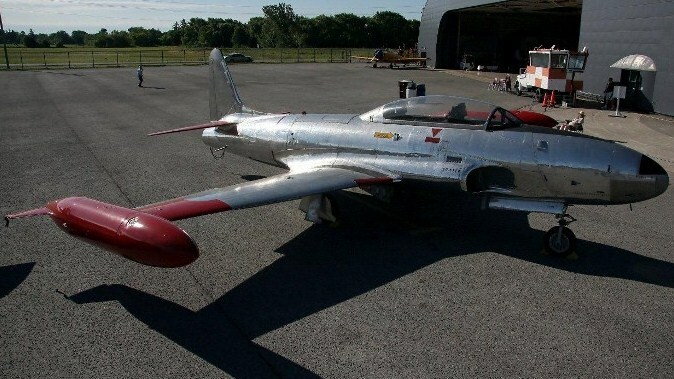 The Museum&apos;s T-33 will eventually be restored to its original markings, a support aircraft for the Snowbirds aerobatic team that was based at No. 2 Flying Training School in Moose Jaw, Saskatchewan. The Lockheed T-33, or T-bird jet trainer evolved from the USAAF’s first operational jet fighter, the P-80 Shooting Star, which flew initially in January 1944. Lockheed stretched the P-80 airframe, added a rear cockpit and the T-33 was born. When it first flew in March 1948, a legend in aviation history was created, similar to the Harvard. With the switch to jet propelled aircraft, the RCAF needed a jet trainer and the Lockheed T-33A was the obvious choice. 30 were ordered in 1951 and were named Silver Stars. 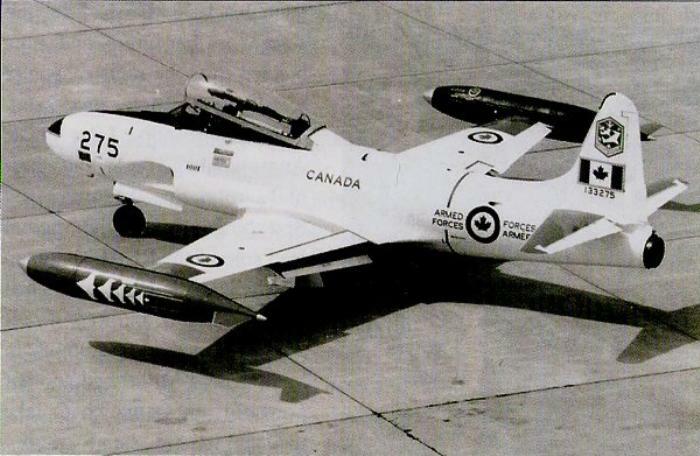 Later, the same year the RCAF awarded Canadair a contract to build a large number of T-33 jet trainers, under licence. Unlike the Lockheed built aircraft, which was propelled by an Allison J-33 engine, the Canadian version was fitted with the more powerful Rolls-Royce Nene 10. 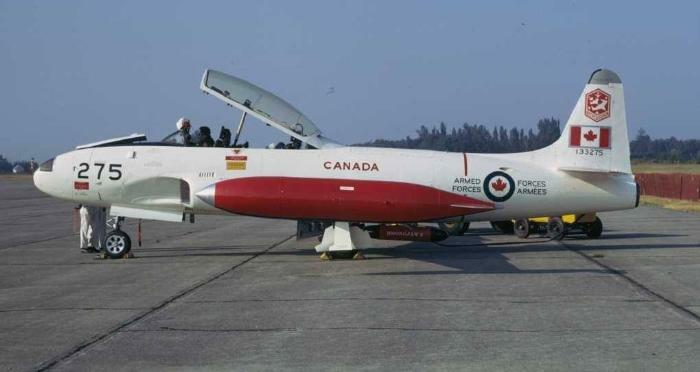 The first Canadair built T-33AN flew from Montreal in October 1952 and entered RCAF service the following year. The aircraft was destined to become one of the most versatile jet aircraft in Canadian skies. 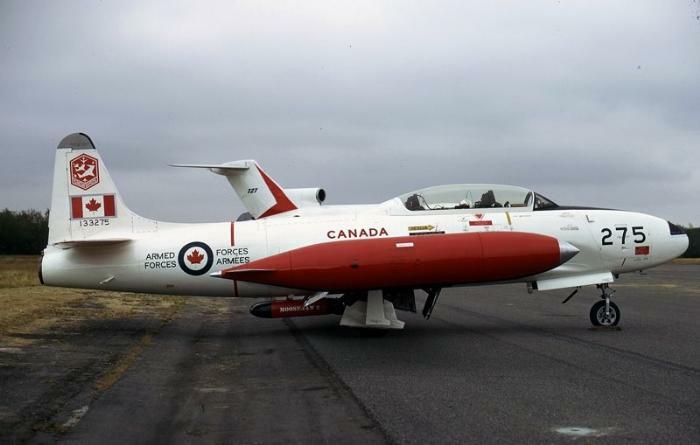 Besides training pilots, the T-bird became well known to the public during the 1960s, through the RCAF’s “Red Knight” solo aerobatic displays. It continued to be the Canadian Forces’ advanced jet trainer until 1974. 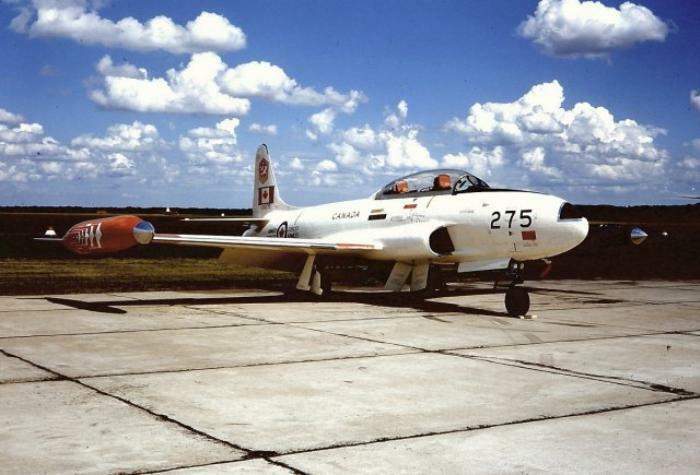 The T-33 then switched roles to provide electronic-warfare and target/adversary training for air force fighters and the armed forces’ anti-aircraft defence systems. In its electronic warfare training role, the aircraft carried sophisticated radar jammers that could overpower or deceive an adversary’s radar. In addition the aircraft could simulate anti-ship missiles and tow targets in support of Canadian Naval training. 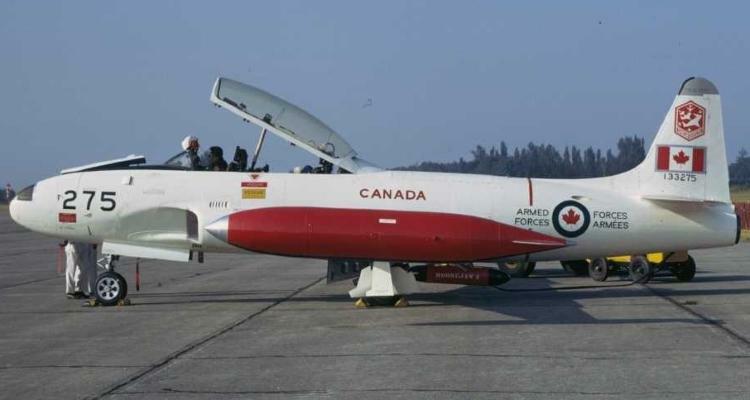 The last T-33 Silver Star was retired from the Canadian Forces in March 2005, by No.4 Wing, AETE, at Cold Lake, Alberta. Canadair stopped building T-33s in 1958 and Lockheed a year later. A total of 6557 T-33s were produced - 656 in here Canada and 210 in Japan. In its peak years, the T-33 was flown by 30 air forces around the world. The Museum's aircraft was acquired from the Dept of National Defence in late 1995. It had been a support aircraft for the "Snowbirds" aerobatic team, based at No. 2 Flying Training School, Moose Jaw and will eventually be restored in those markings.